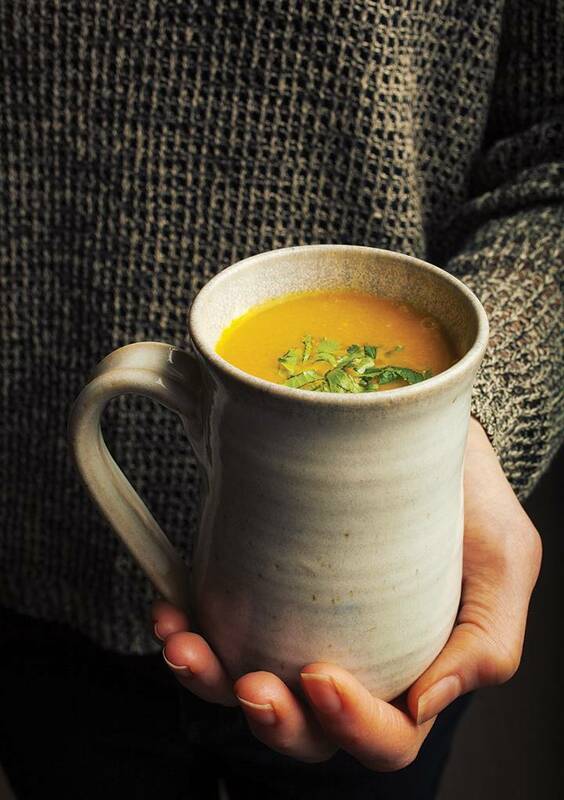 This is the perfect way to start a dinner party — or just make it for its healthy dose of beta carotene, fibre and vitamin A. It’s a smooth, colourful soup, creamy yet low in calories, with curative cumin and cleansing ginger too. In a large saucepan, heat the butter and sauté the celery, onion, garlic and ginger over medium heat for 5 minutes, until tender and fragrant. Add the ground coriander, curry powder, cilantro stems and carrots, and cook together for another 5 minutes. Add the broth and bring to a boil over medium high heat. Reduce heat to low, partially cover the pan, and simmer for 30 to 40 minutes, until vegetables are tender. Cool the soup slightly, then transfer to a blender or food processor to purée. Return the soup to the pot and reheat. Thin with a little extra broth or water if necessary. Stir in the lemon juice and season to taste with salt. Ladle into soup bowls and garnish with fresh cilantro.